The city is harmonious, characterized by a very sensitive and tasteful connection between old and modern with typical Scandinavian architecture. This second largest city in Norway is commonly labeled as the rainiest city in Europe. Supposedly, it rains up to 360 days a year, and the remaining days are mostly cloudy. At the time of our visit, in July, it was brilliantly sunny. That is why summer is the best to visit this beautiful city and entire Norway too. It does not rain so much, and the city is full of beautiful greenery and a great atmosphere. Many cafes in the old Bryggen district take out the tables and chairs, while drinking coffee the visitors can enjoy the warm sunshine and fascinating views of the surrounding area, the Vågen Gulf and many anchored ships. The city is harmonious, characterized by a very sensitive and tasteful connection between old and modern with typical Scandinavian architecture. Supposedly, it rains up to 360 days a year, and the remaining days are mostly cloudy. Besides the fish in Norway, there are many exotic fishes and various rare products. 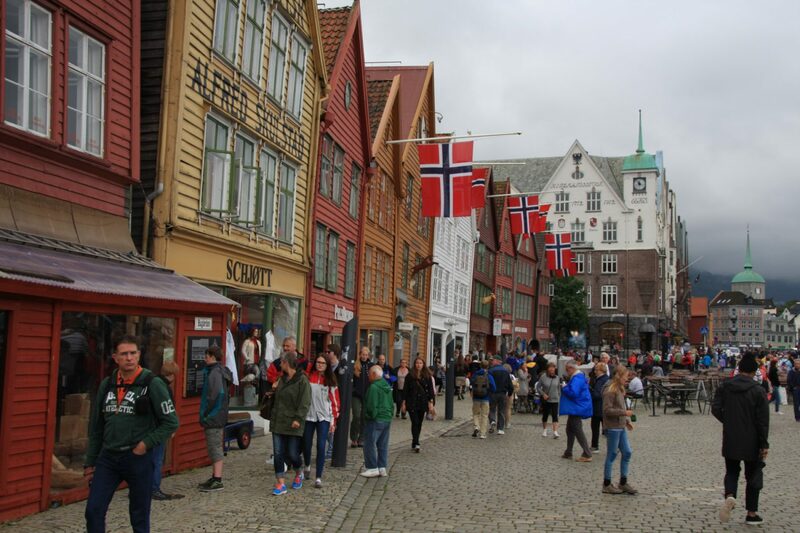 Bergen can be easily reached by airplane, and the city can be the ideal starting point for exploring the beautiful Norwegian nature, especially the fjords. Another option to be chosen is to take a train from the capital Oslo. The trip by a very comfortable train takes several hours, but it is embellished by stunning views of beautiful nature, lakes, many waterfalls, lakes, massive mountains and mountain passes. It is an unforgettable experience and at least a quick look at the pure Scandinavian nature. The journey ends in a city where supposedly live very happy and cheerful people, even the chattiest ones. 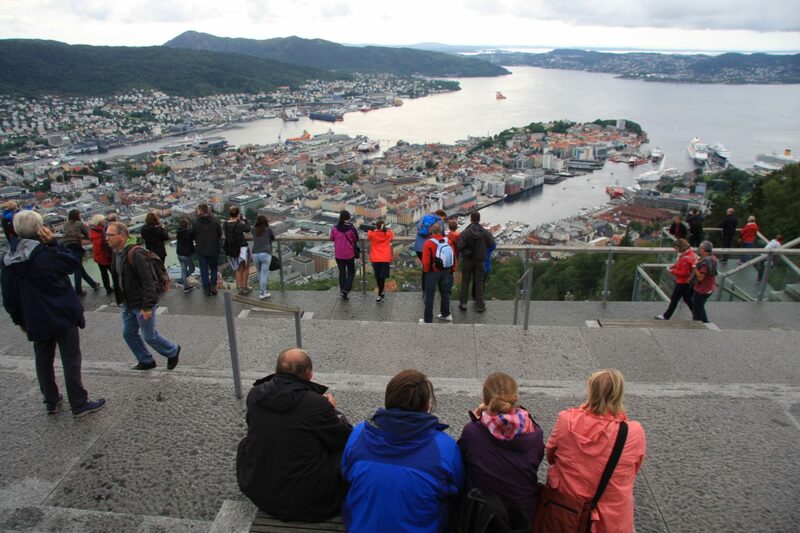 The best starting point for sightseeing in Bergen, which will appear to like a small town, is the observation deck at the Fløyfjellet Mountain, also known as Fløyen; this is one of the seven hills around Bergen. You can reach up to 320 m by the funicular directly from the city center, and go back on foot through the fragrant coniferous forest. The view is stunning. 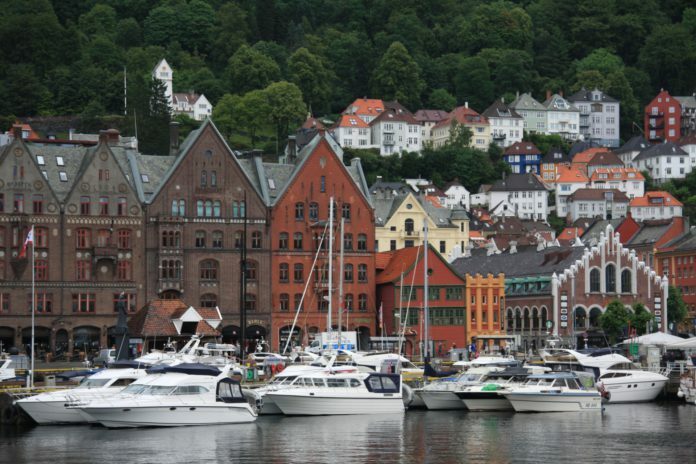 You will see Bergen as if on the palm of your hand, plus you can admire beautiful sea bays, boats and fishing boats, nearby and distant mountains, scattered villages and typically Norwegian wooden houses. The best starting point for sightseeing in Bergen, which will appear to like a small town, is the observation deck at the Fløyfjellet Mountain, also known as Fløyen; this is one of the seven hills around Bergen. 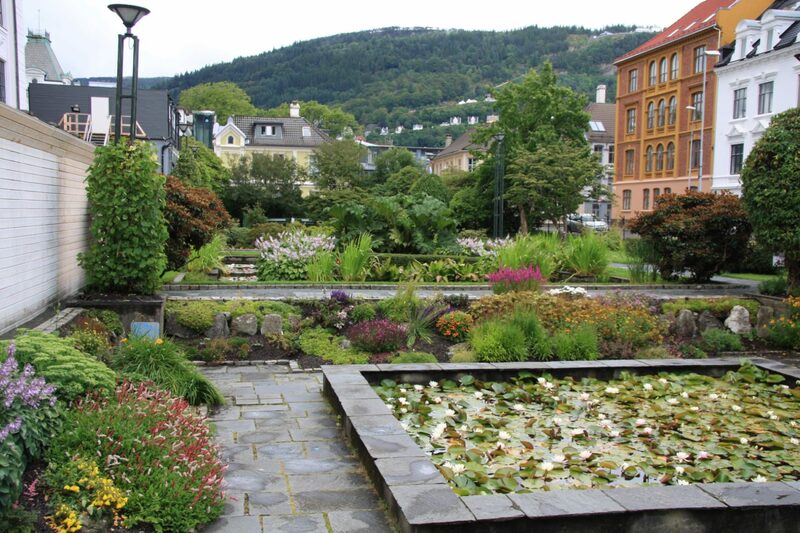 After hiking down from Fløyen Mountain, head to the Vågen Bay, which is an indispensable part of Bergen’s old town. At the entrance of the bay, there is an ancient and massive stone fortress. On the northern side, you will find the most picturesque and perhaps most photographed part of the city – a set of old business houses with vibrant, colorful facades. There are many old shops or small cafes, and it’s also worth to visit small alleys and passageways and discover the magical yards. You will feel as if time has stopped here. The houses have even burned down several times within the years, the last time there was a fire in 1955, but they have always been restored to their original beauty and are now listed on the UNESCO World Heritage List. In this old district and elsewhere in the city you will also find exciting museums and galleries that can be the ideal choice during rainy days. During the sunny days, you certainly will not miss the botanical garden. During the sunny days, you certainly will not miss the botanical garden. On the opposite side of the harbor, the Fisketorget market is worth seeing. You can try delicious fish products here you will be thrilled! There is a wide range of products; the favorite items include salmon but also many other types of fresh fish and seafood. In the city, you can also visit the unique Norwegian fishing museum and even the marine aquarium, supposedly the best in Europe. Besides the fish in Norway, there are many exotic fishes and various rare products. Next articleWhich Restaurants Starred in the Michelin Guide 2019?